Game Freak once diversified away from Pokémon by unleashing their creativity on smaller projects. Unshackled from the pocket monsters from which they have risen to fame, that saw them produce HarmoKnight and Tembo the Badass Elephant, even if that second title stampeded straight past Wii U for a somewhat suspect reason. Their latest effort to leap over the usual localisation hurdles to reach western shores is Pocket Card Jockey, and it couldn’t be more different from their previous experiments. Horse racing and the classic card game Solitaire are the ingredients that it greedily munches from its trough, a well-calculated dietary choice that spurs a courageous gallop toward an addictive experience that soon proves hard to resist. On paper, it sounds like an idea that is destined to have as much success as one of Baldrick’s cunning plans. 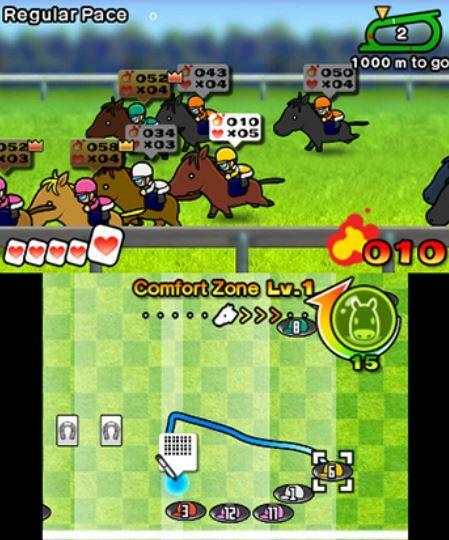 Stylus in hand, Pocket Card Jockey challenges you to play Solitaire on the touch screen, with success rallying your jockey and horse’s competitive spirit in a race depicted on the main screen. Jockeys are required to find a trainer that will let you race on one of the horses that they have prepared for the races, and, while your fledgling career will limit you early on, victories will lead you to eventually compete in the Royal Derby and All-Star Cup. Horses can be trained to make them stronger and faster, a necessity if you are to maintain a competitive edge in races. But, after your jockey becomes far too eager to get started, their lack of understanding the basics leads to them being thrown off their first horse and into the path of others racing past. This leads to a humorously dark near-death experience where Mr. Maekawa, your first trainer, appears disguised as an angel, scorning you for your lofty ambition given that you can’t train properly and haven’t won a maiden race. Promising to bring you back to life if you can fulfil your dream, your jockey blindly admits that their actual dream is to inherit their dad’s orange farm. That sudden diversion is questioned, even if it is a more realistic goal in comparison to winning the Royal Derby. With it being hard to train horses, the Angel asks whether there is anything that your jockey is particularly good at. Solitaire is the answer, and therefore the two are magically fused together. Play Solitaire well, and your horse will match your card game talent on the race course. If it opens with quirk and naivety, Pocket Card Jockey soon unravels into an experience that many will lose hours to. While the mash-up is as obscure to play as it sounds, it is simple to rein in and understand exactly what you are being asked to do early on. That’s mainly thanks to Horse-Off-Course, your four-legged tutor who makes repeated appearances to introduce the underlying mechanics. Players must clear cards from the tableau pile on the touch screen, picking up those from the bottom of each column and using them to remove another with a consecutive card value. Get stuck and you can turn to the stock pile, although there is a limit to the number of cards that can be drawn from here. It’s far easier to grasp than I have perhaps made it sound, but take confidence in knowing that Horse-Off-Course is there to help you every trot of the way. Strategy underpins the entire experience, right from the gates where Start Solitaire can help you build Unity Power early on. Players then continue to build this mid-race by playing Solitaire rounds, improving your horse’s mood and ultimately letting you control their course. Gathered Unity Power may be converted into Energy, but, as they continue to gallop around the course, players must make sure that their horse is positioned in the Comfort Zone to build more Energy. This can then be unleashed by slamming the Giddyap button, which, if used timely, can see your horse power on through the homestretch to victory. Your horse’s stats will grow after each race, at least until they reach the retirement age at 3 years old. And, beyond that, there are multiple ways that you can sink plenty of time into Pocket Card Jockey‘s surprising depths. Each horse has their own running style and trait that they are born with, while, as they grow, they will have the chance to develop new skills. These include: Dash Start, which decreases the number of cards used in Start Solitaire; Good Tempered, which will make it harder for the horse to be in a bad mood; and Tiny Solitaire, which makes your tableau piles smaller. There is so much variance that can help sway races in your favour, while items that you can purchase will help make up for any shortfall. If you are particularly proud of your prize-winning horses, you can pair two horses of the opposite gender to breed them. This will make sure that your hard work is carried into their offspring, meaning that it is important for you to do so before they near retirement. Your retired horses can be traded with other players as QR Code patterns, while StreetPass support is basic but will let you share your best race times with those that you wander past. What’s clear is that this isn’t a hastily put together mash-up, and that there is considered thought behind every aspect that drives the unexpected concept. Pocket Card Jockey is packed with Game Freak’s wondrous charm and character. It heartily succeeds in marrying together two pastimes, which comes as a surprise given that they are such polar opposites. It captivates and baffles in equal measure, but, with a thunderous sound of hooves, charges over the line with a near-perfect finish.